It’s ANOTHER FIRST for Electric Picnic 2018! La Fura dels Baus lands at Electric Picnic – and in Ireland – for the FIRST time in their 40-year history. The unique, dramatic arts show called “Human Seed” has been created exclusively for Electric Picnic 2018, promising to be a spectacle that will enthral and excite and quite possibly prove to be the most dazzling performance yet at Electric Picnic! This spectacular show will go beyond the limits of what has ever been witnessed to date. 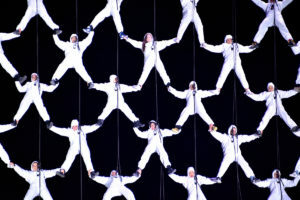 La Fura dels Baus troupe will create a mesmerising human net with the help and addition of 55 Irish volunteers. As the human net takes centre stage, it will be raised to a death-defying 40 foot over the wondrous eyes of the picnickers at Stradbally Hall. Adding further drama to the mesmeric marvel will be a 10 metre moving TRANSFORMER style puppet, that will illuminate the night time skies as it towers over the crowds below. Directed by Pera Tantiñà, La Fura dels Baus have crafted their performance based on the story of how humans grow and come together. The show ‘Human Seed’ will become a symbol to the flower of life, for the germination of humanity. This year’s picnickers will have the privilege of witnessing this astonishing WORLDWIDE PREMIERE created specifically for Electric Picnic 2018. La Fura dels Baus is set to be a spectacle not to be missed and one that will definitely not be forgotten by any picnicker! Notes to editors – ‘The Human Seed’ – The flower of life can only be found in the mountain of Nanic. Neira was the only one courageous enough to volunteer to go find the flower so that humanity could blossom again. She sang to the Gods to join forces with her and they gave her the strength of a Titan. She travelled through the woods and used her singing to drive away the evil. In Nanic, she found the flower of life but when she tried to pick it, the flower opened and decomposed into thousands of seeds. Neira sang again to the Gods crying with despair, but when her licks touched the ground, the kernels from the flower of life begin to grow and humanity germinated from those human seeds.